This website is intended to provide information about orienteering and some of the basic knowledge and skills involved to help those new to the sport get a better understanding of orienteering. Orienteering is an outdoor adventure activity involving navigation over unknown terrain, using a map and a compass. It can be enjoyed as a relaxing recreation, or as a challenging competitive sport. Local orienteering clubs put on regular events in parks, wilderness and even urban areas. 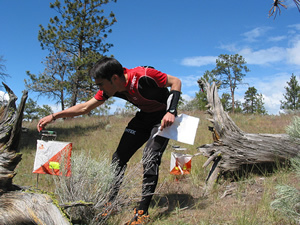 At these events, you will find several orienteering courses designed to challenge anyone from recreational enthusiast to competitive orienteer. If you have a love of the outdoors and enjoy map reading, come give this exciting activity a try. All you need is a compass and a whistle.